"T-shaped thermistor thermometer, ±1º C accuracy"
"T-shaped thermistor thermometer, ±2º F accuracy"
"Surface probe for FoodCare thermometers, white handle"
"Low cost thermometer with stainless steel probe, degree C"
"Rugged, Accurate and Reliable Thermometers, Measuring from -50.0 to 150.0°C or -58.0 to 302.0°F"
"Thermistor thermometer in ""C"" with probe HI765BL"
"Thermistor thermometer in ""F"" with probe HI765BL"
"K-type thermocouple in ""C"" thermometer, probe not included"
"K-type thermocouple in ""F"" thermometer, probe not included"
"uP, K, J & T-type with C/F thermocouple thermometer"
"Waterproof-2 channels. 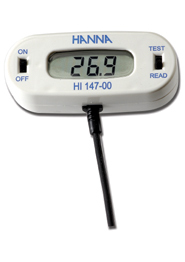 thermistor thermometer with wrist strap, temp. probe "
"Dual-channel, waterproof K, J, T-type thermocouple thermometer"
"Waterproof K, J, T-type thermocouple thermometer"
"Waterproof K, J, T-type thermocouple thermometer with RS232"
"Dual-channel, waterproof K, J, T-type thermocouple thermometer with RS232"
"Printing Pt100 thermometer, 1 channel input, paper, batts, cal. cert." "Printing Pt100 thermometer, 2 channel input, paper, batts, cal. cert." Checktemp®1C Thermistor thermometer + NIST Cert. Checktemp®1F Thermistor thermometer + NIST Cert. "ELTH CWP Pocket thermometer, waterproof, with probe"
"ELTH FWP Pocket thermometer, waterproof, with probe"
"Printing K, J, T-type thermocouple thermometer with carrying case"
"Printing K, J, T-type thermocouple thermometer, 1 channel input, paper, batt., cert." "Printing K, J, T-type thermocouple thermometer, 4 channel input, paper, batt., cert." "Printing K, J, T-type thermocouple thermometer, 1 channel input, probe, paper, batt.& cert." "Logging K, J, T-type thermocouple thermometer with carrying case"
"Logging K, J, T-type thermocouple thermometer, 1 channel input, paper, batt. & cert." "Logging K, J, T-type thermocouple thermometer, 4 channel input, paper, batt. & cert." "Infrared thermometer (°C) with IR sensor, -20 to 199.9°C"
"Infrared thermometer (°C) with IR, NTC sensor, -20 to 199.9°C"
"THERMOMETER ADAPTER ASSY 14/10 (BUSHING,O-RING,ADAPTER)"